I'm going to North Carolina to visit my brother and sister-in-law. Love that southern hospitality. Guess it's just the outlaw in me that likes to see a dog free of the leash. Well, look what we have here: a beautiful shiny turquoise car. And there's a bench just opposite it. 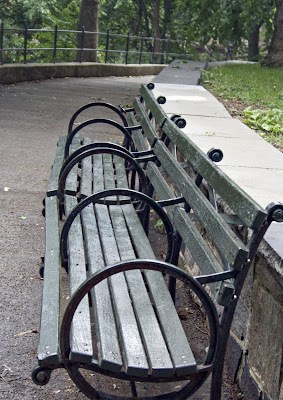 I bet if I just sit on this bench for a while, a tall man wearing a bright blue shirt, walking a fluffy white dog will walk right in front of it. See those tiny people on top of the rock at the top of the picture? If they had looked down, they would have seen a tiny person pointing her tiny camera at them. 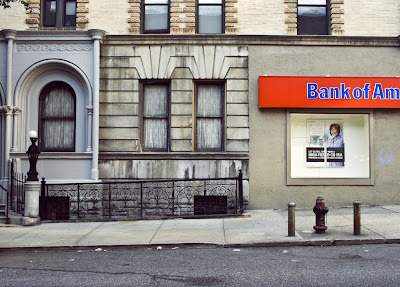 How nice of Bank of America to brighten up this dull gray building. 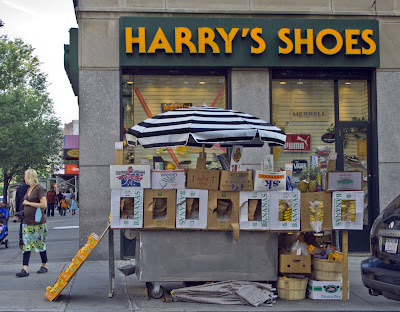 To my surprise, there are numerous reviews for Harry's Shoes. None for the fruit stand, but I think they're overstocked with bananas. Draw your own conclusion. New walk today; this photograph is practically dewy, it's so new. Once AGAIN, I didn't go where I planned because I got a Late Start, 4:44 p.m., to be exact. But it turned out fine. 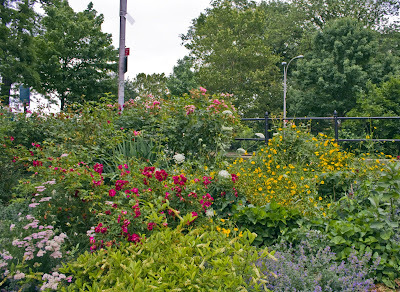 I walked along Riverside from 83rd to 94th Street, this being the right weather for walking Riverside. When it was colder, I kept being turned back by the wind. Today the wind was welcome and was known as "breeze". What a nice breeze! I was pleased to be able to color this in on my map. 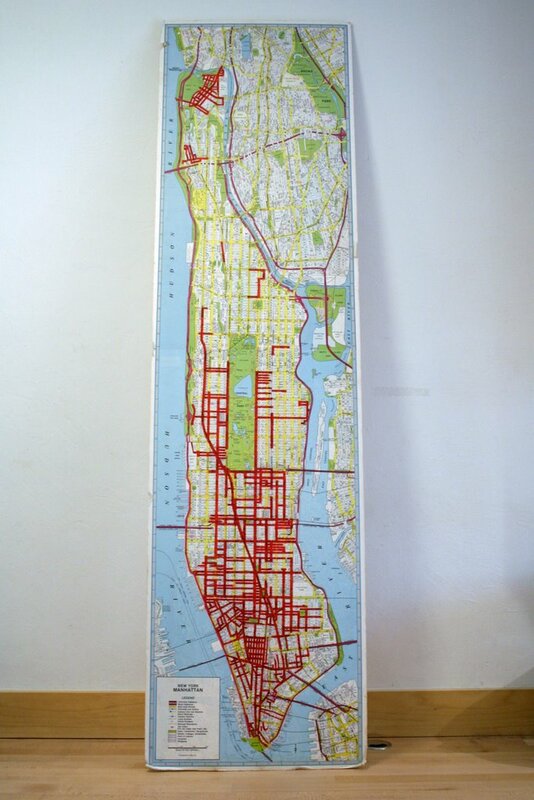 I'm trying to outline the Upper West Side. But first, here is a pre-walk photograph as I walk down Broadway to get to 83rd Street. I've not only photographed this block before, but I've photographed this actual spot. However, I'm sure you'll agree that I couldn't pass this one up. 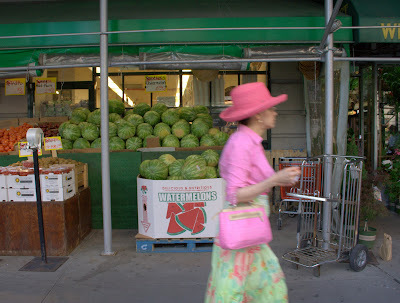 Lady dressed like big gorgeous watermelon strolls in front of watermelon display. I hope she's on her way to meet a man in a white suit at a beautiful outdoor café and they both order watermelon margaritas. Isn't this a beauty? You've seen the side of this house before. First I'll tell you what this is and then I'll tell you what it does (to me). 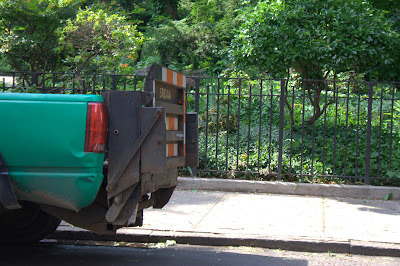 This is a New York City Government Parks truck (for official use only) parked in front of Bruce's Garden. Bruce Reynolds was an Inwood resident and a Port Authority Police Officer who lost his life in the terrorist attack on 9/11/01. When he was a child, he was involved with his father in restoring the park and garden. This garden is now dedicated to him. His father still works there. Oh, never mind what it does to me. Well, I'll just say that artificial green laid next to natural green affects me more than is reasonable. Not a street but I don't want to hide away this miracle of sunlight. 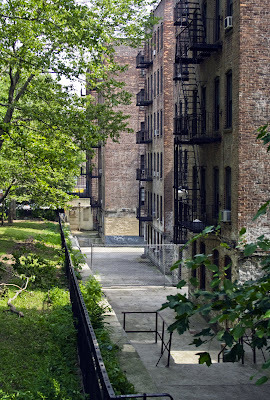 These are the backs of the buildings facing Isham street. In the first one you can see the one story building at the very end which is the canvas for the wall painting. What can I say? Sometimes I just get lucky. We're standing next to Grandpa's, looking north on Broadway. 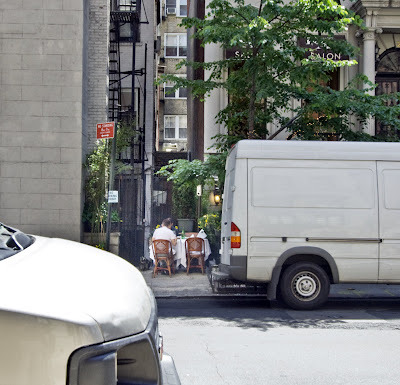 When I started this blog almost two years ago, I had already walked many streets in Manhattan as part of my ongoing pretty casual project to walk them all. 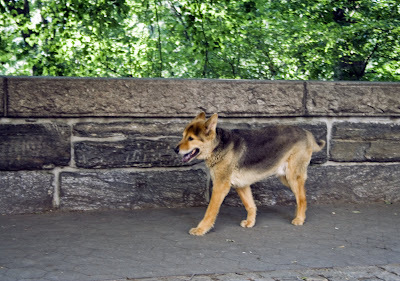 It wasn't until I got a digital camera that it made sense to record the walk in a blog. And my assumptions were that 1) I wouldn't be photographing streets I'd already walked, and 2) sometimes I would be walking streets without a camera. After all, the important thing was walking every street. However, obsession does tend to build on itself, I've learned. And now I want a photograph from every street (every block?). That is why I'm showing you this piece of Broadway and why I will be showing you a block of Isham Street, though they have long been marked off my map. Thought you should know. This little girl had great clothes and great energy. 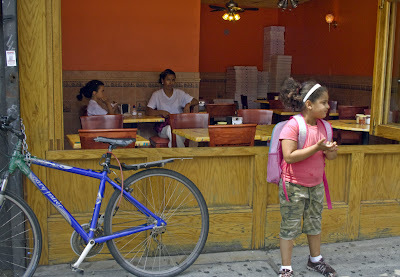 She was all over the place, and I had a hard time chosing which photo to show you, but I finally picked this one in front of Grandpa's Pizza, partly or mainly because the wall inside matches her shirt. Grandpa's is highly regarded by many, but the one time I had pizza delivered, I thought it was pretty standard. Grandpa's is on this block. Tonight I have a six-photo story to tell, full of suspense. This wasn't the big walk I planned, but circumstances dictated a stroll close to home. I knew there was an update to be made not far away, through Isham Park. This is the entrance at the end of Park Terrace East. 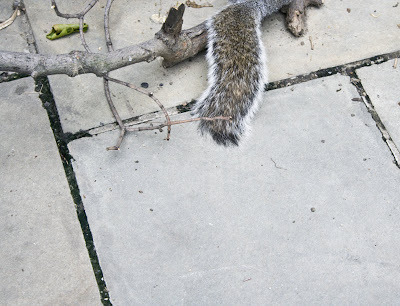 Below is an attempt to photograph an Isham Park squirrel in an interesting way. 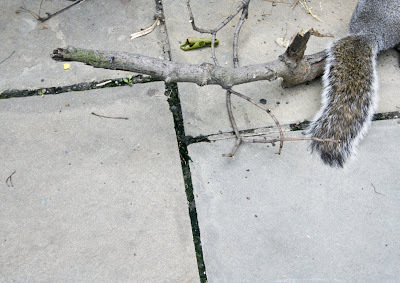 In case you're worried that is a disembodied squirrel tail, look below and be reassured. Yes, indeed. A new wall painting. 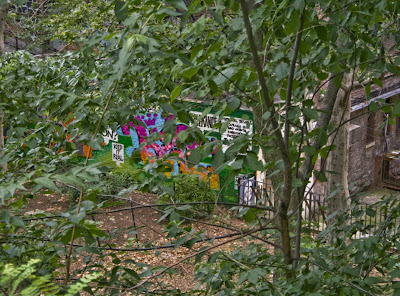 Since there are four earlier paintings at this site, I have now put them into their own category: Inwood Wall Painting, but you will still find them mixed in with Street Art and Graffiti. I'm not taken with this one as much as the others. The words in the white boxes are too dominating for my taste. It's the white boxes, mainly. What think you? There's the bus stop, as promised. If it doesn't rain tomorrow I'll have something new. It's not supposed to rain tomorrow. This convoluted little walk is almost over; I'm just trying to find the bus back to the West Side. Since 66th Street is one-way going west, you might think that would be the street to catch the 66th street crosstown bus on. But no. 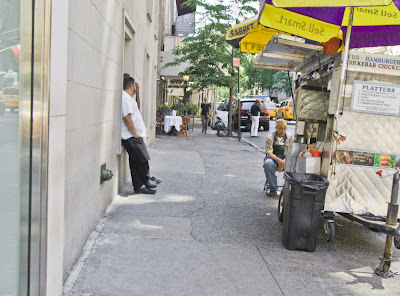 So I walked up to 68th Street, the next street going in the right direction, no luck there, either. I finally found a friendly doorman who told me to catch it on Fifth Avenue. That's where I'm headed now. Doesn't that Danger sign tempt you? I want to see the open pit. 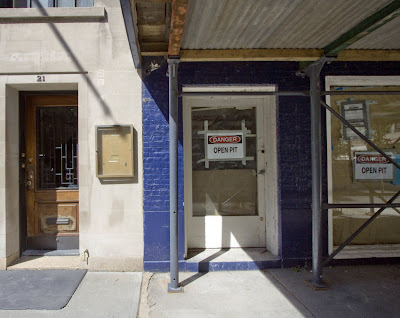 And who had the nerve to paint that brick blue in the east 60's, just off Fifth? When they find the guy, that's what that open pit is for. 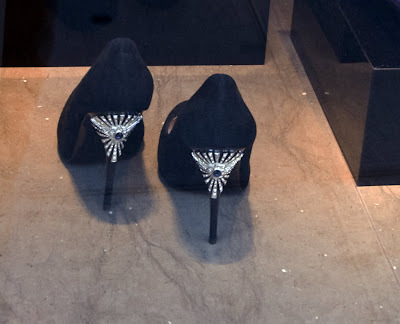 I apologize for not getting the name of this shoe store, but if you feel you must have these shoes, you should be able to find them. 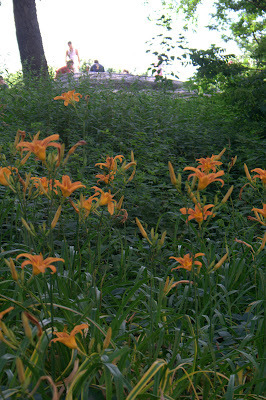 Just walk very slowly along the west side of Madison, you can't miss them. 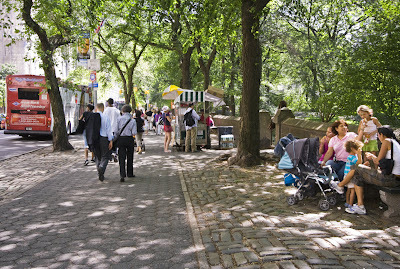 Enough of sunlit leafy streets! 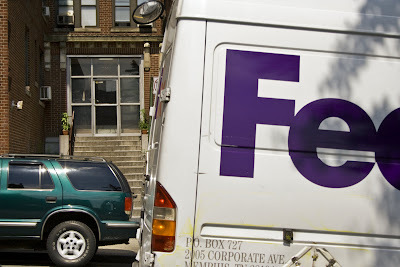 Now we're back on Madison Avenue where commerce rules. 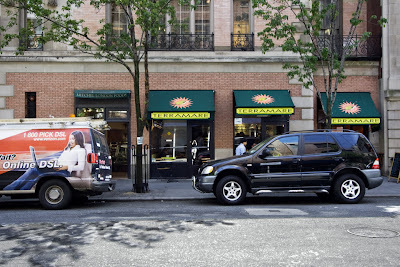 The store on the left is Paul & Shark, an Italian sportswear company, and on the right is Nicole Miller, women's fashions and men's ties, among other things. 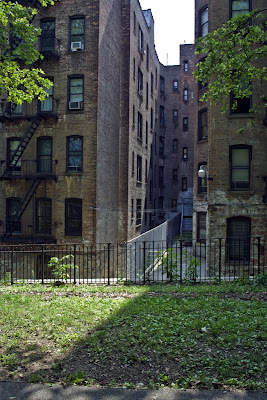 However, the reason I took the picture was for the space between the two buildings where the fire escape is. I love how that space flattens out and looks like an abstract painting. I probably should've saved this photo for some rainy, cold day when it would cheer us up; now we've had a surfeit, an overabundance of sun and summer for days, so this is no big deal. Have you spotted the girl yet? Would I have posted this photo if those two little lamps hadn't been in the windows? Probably not. The photo below is 66th Street at Madison. 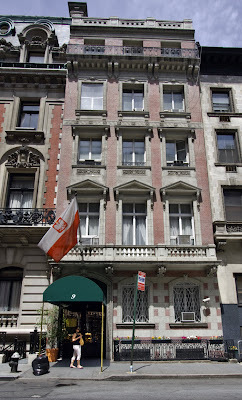 This building is known only as 45 East 66th Street and was built in 1908 as an apartment building with two 12-13 room apartments on each floor. As of 1988, when this Streetscapes column was written, a "handful" survived intact. The column concerns the major restoration done in 1988 to restore the façade to its original form. 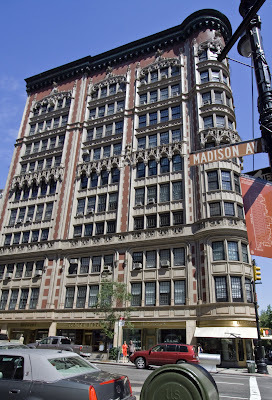 The AIA Guide to New York City describes it thusly: "Two glassy 10-story walls of 12 over 12 double-hung windows intersect in a magnificent cylinder of even more windows, making this one of the city's grandest facades." 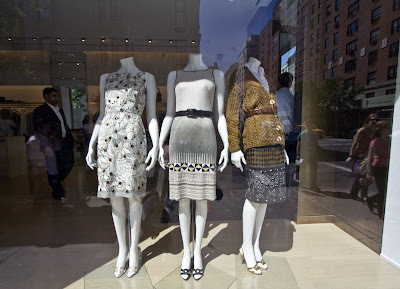 A window of Oscar de la Renta's store on the corner. 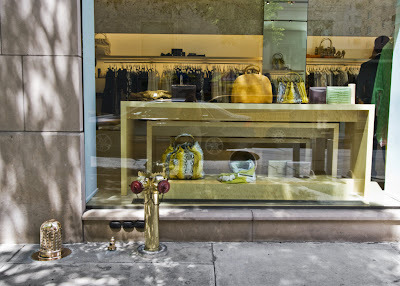 I was taken by the matching jewel-like sidewalk hardware, especially the large thimble thing. And the next window. I stood there for a while admiring the display and the middle dress in particular. I was saying to myself that it looked like architecture (the middle dress), although I'm at a loss to defend that thought. This store has been here for only a few years; before that women had to wait for his new collections to show up at high end department stores. Women don't like waiting! Being hot, tired, cranky and hungry, Chat Noir had the edge over forging ahead. It was a good decision, and a wonderfully pleasant lunch, though expensive, and I emerged a happier person. I had a frisee salad with poached egg, a glass of good white wine I hadn't heard of before, and can't remember now, but wish I could, tarte tatin and espresso. Well, no wonder it was expensive. This photo was taken after lunch. 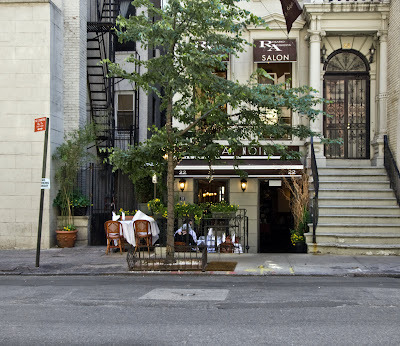 When I went in, the outside tables were filled – you can see, there are three downstairs in the entryway and this one on the sidewalk. Lovely, yes? Now take a look at the sidewalk table in an earlier shot and then from another viewpoint. Lunching in the traffic just down from the Sabrett food cart. We New Yorkers have special invisible blinders we wear at times like this. Food cart? What traffic? Here I am at Madison considering whether I should forge on or go back and check out Chat Noir. Here it is, folks. The Charles Scribner House, the destination for this photowalk. 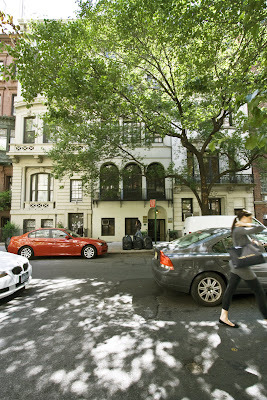 Lovely, but – well, it doesn't seem more lovely than many, many other townhouses on the Upper East Side. 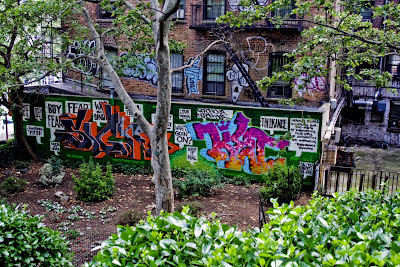 NEW YORK'S blocks are full of hidden networks, families of buildings related by appearance, type or design. 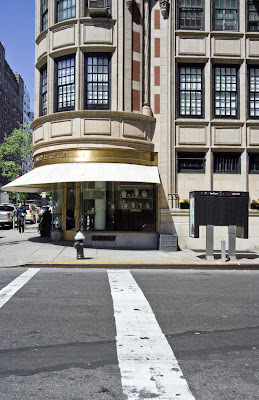 One of these is now in mid-restoration as the Polish Mission cleans and repairs the facade of the 1912 Charles Scribner house at 9 East 66th Street, one of six buildings in Manhattan designed by Ernest Flagg for the publishing family. 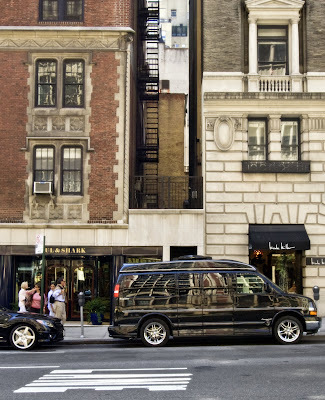 -- gives a certain order to New York's often chaotic streets. The thrust of the newspaper article is that this building is one of six that form a "hidden network" and you might want to search out the other five because they're all still standing. 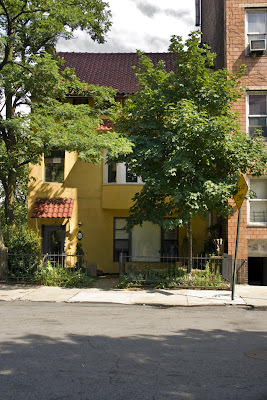 The thrust of the article in the book is that this is the house of Charles Scribner and isn't it lovely. You can probably tell which version I prefer. 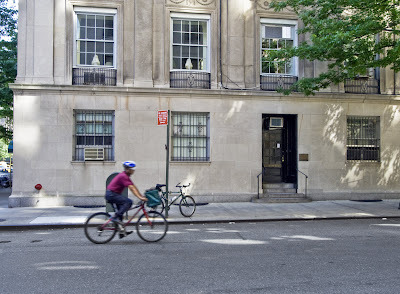 BTW this is now the Permanent Mission of the Republic of Poland to the United Nations. 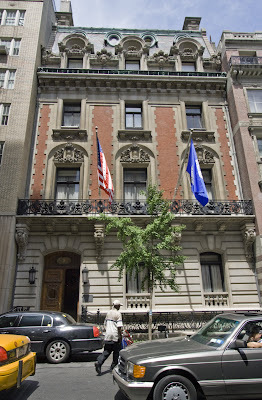 This is the Lotos Club, the building immediately before our destination building. Finished in 1900. 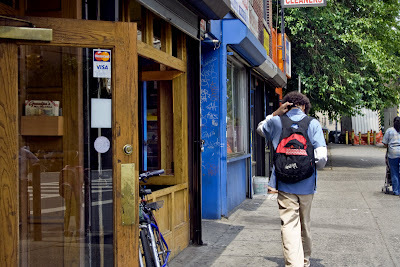 Visit New York Daily Photo to see interior shots and a brief history of the club. Paul Goldberger in The City Observed calls it "a grand Second Empire Mansion, which piles an ornate two-story mansard on top of a red-brick midsection on top of a rusticated limestone base. The detailing is lavish and comes tantalizingly close to excess. The ability of Hunt [Richard Howland Hunt] . . . to push this design right to the edge and yet never lose control in impressive." Now see, I want to know architecture well enough to be able to look at a building and say things like that. 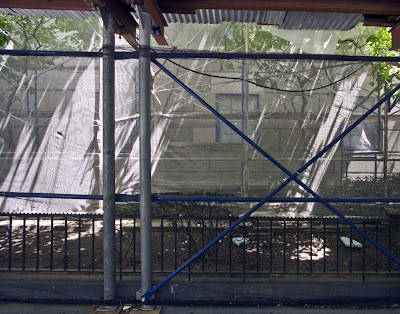 Here we have a glimpse of Temple Emanu-El being obscured by the scaffolding which is everywhere in New York. The Temple is the world's largest synagogue, according to sacred-destinations.com. This looks more like Venice than New York, partly because the wide angle lens I'm using here exaggerates the street and makes it look more like a plaza than a side street. Reality is elusive. In other news, I just have to shout it out that this year I am proud to be a Democrat again. It was tough going there for the past few years, but now we Democrats have changed the political landscape. All you women upset about Hillary's stolen opportunity, just start thinking about the next woman candidate because Hillary has proved that a woman can be tough and get lotsa votes. But now the most important thing is to elect Obama. Yeah! Terramare looked promising for lunch, but by the time I was ready for lunch, I'd forgotten all about it and gone on to another more enticing spot. Eeek! What's this? 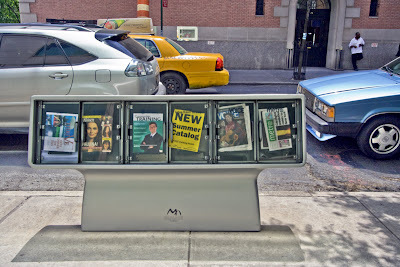 Tasteful newsboxes? I mean box. As opposed to these (scroll down)? How could they? I'm joking and yet I'm not. One must learn to live with ambivalence. Friday, I did something different for a photowalk. Typically, unless I have an errand which lends itself to a photowalk, I look at my map and choose a place, go there, see things that interest me and come home and research them. 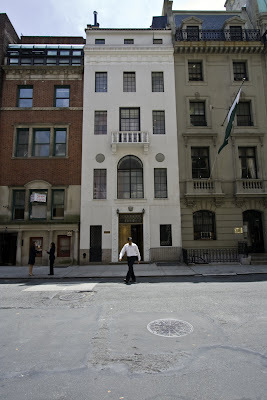 This time I randomly opened my book New York Streetscapes to page 215, the Charles Scribner House at 9 East 66th Street. This worked. 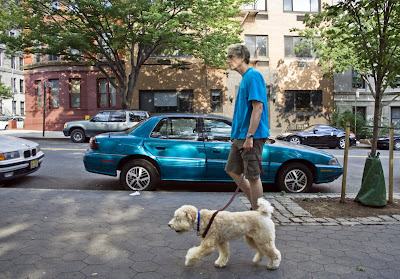 I hadn't been to the East Side for a good while and I hadn't walked that street. 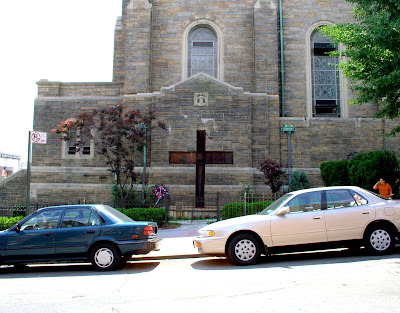 So after therapy and after shooting the church on 86th street, I went downtown and took the 66th Street crosstown bus. 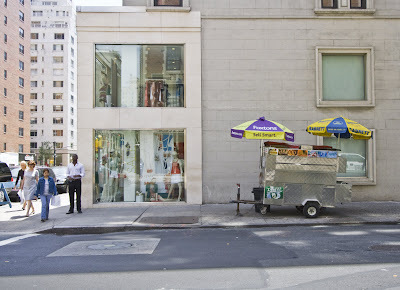 It let me out on Madison and 65th Street. While at that intersection I took this shot. Can you guess why? Well, Citibank. What's this with the black? 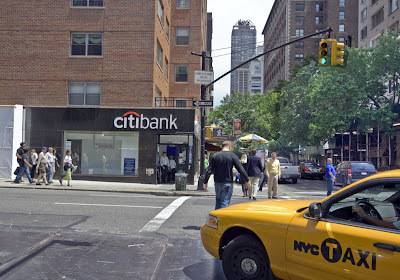 Citibank has been blue for as long as I've banked there, which is since 1982. After much pondering, I came up with this explanation. Just like me, Citibank has noticed all the banks going blue, I can't think what they are now but – and in fact, maybe that's the problem. Blue doesn't identify anyone now, since so many use it. So Citibank is going to be different. I can just imagine the meeting. Green might be suggested. No, it's a little too friendly. Purple or yellow, no way. But black. Genius!